I want you to have a garden you LOVE. It’s as simple as that. That’s my goal and the focus of our work together. You’ll soon know that your impossible dream isn’t impossible after all. For the struggle to end and for peace to break out. To basque in the glow of your achievement as your garden bursts into life. To feel the loving embrace of a beautiful garden that holds you in a BIG GREEN HUG everyday. You can do this and together we will work it out. Not everyone wants a total garden re-design – you might want planting advice & border designs and planting plans. Or you may want to change the layout, add a vegetable plot or you might want to have some one-to-one teaching as you work through your project and my services reflect these various levels of need. I offer comprehensive packages of support that are tailor-made for you so that you get the help you need. Planting advice & plans with shopping lists – Tells you what plants to buy, how many and where to plant them. Companion gardening (together we prepare the garden) – Advice and guidance and it makes the process a lot more fun. Personal plant shopping service. (Shopping together) – Retail therapy is always a good idea! Companion planting where we plant the plants together – Sharing the excitement of watching it all come together. Follow up teaching and guidance – If you have questions, they will be answered. I’ll be there for you when you need me. A bespoke maintenance plan – The Garden Whisper – This is so useful and means you have my support over a whole year! That’s a lot of support! The first stage is always the FREE 30 minute consultation. This is where we agree that we’d like to work together. The next step is the detailed consultation – here we will put together your package of support – based upon your vision and your needs. I will send you a written summary of what we have discussed and agreed. It may also include recommendations and a plan of action. Once the package is agreed we get to work. 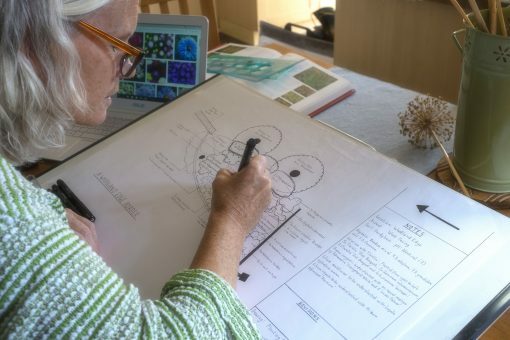 What happens now depends upon your package but it might be me giving planting advice, drawing a design or a planting plan for you and sending you a detailed shopping list of plants. Or it might mean that we get stuck into clearing an area of your garden ready for planting. As we work through your project together our ideas will evolve and change and we can add to and adjust what we do to match the evolving process. Keep reading to see a couple of examples of how the process worked for two clients. Nicola is a busy lady with a demanding job. We met when I gave a talk on wildlife gardening to her local gardening club. Nicola was thinking of developing her garden to attract more birds and wildlife. 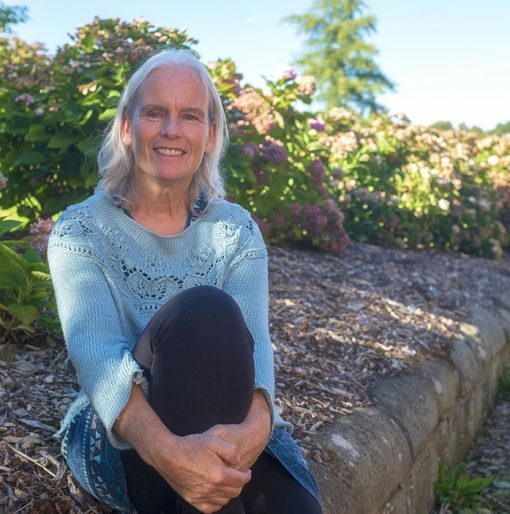 She didn’t feel confident about choosing the right plants and was concerned about the very moist soil in her garden and the condition of some of her plants. During our free consultation Nicola revealed that she was very worried about her small apple tree as well as a few other plants that were looking unwell. We agreed that our work together would start with a consultation with report and then proceed with companion gardening, a trip or two to garden centres to choose plants and more gardening to plant the plants and move the plants that needed relocating. We moved her apple tree and cleared a very weedy area ready for planting. We enjoyed two very sociable and productive trips to local plant nurseries and enjoyed planting everything together. A few months later, I advised Nicola on where to put some more plants she wanted to add and was delighted to see the apple tree covered in fruit and the previously poorly plants thriving. It was at this point that Nicola decided she would like to buy the Garden Whisper so that she has instructions on how to care for all of her plants throughout the year. 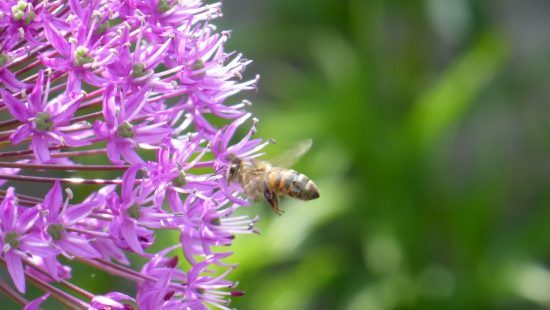 When Rachel contacted me she was feeling fed up, frustrated and overwhelmed by her garden. She had already had one design drawn up but felt it didn’t give her what she wanted. As a very busy self-employed Mum, she longed for a safe sanctuary space that she could enjoy with her daughters; a garden filled with berrying shrubs and trees and beautiful flowers. A garden where she could relax and be herself. We agreed that she needed some advice and guidance about the plants that would give her the look and feel she wanted – more privacy, a better outlook from her new dining area and more beauty but with the minimum of maintenance. 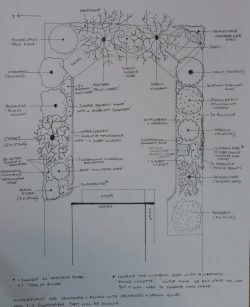 As we talked it became clear that Rachel would really benefit from a planting plan and a layout drawing so we agreed that I would draw a design with a planting plan and provide a detailed shopping list. Rachel was delighted with her plan and felt confident to proceed with the work herself. A few months later she asked me for a little more advice which I provided over a skype call. You can read Rachel’s testimonial here. If your’e in a hurry to make progress quickly or you have a special set of needs – for example, you’d like to grow cut flowers for an upcoming special event then my VIP day package could be just what you’re looking for. This is a day (or even two days) where we talk through your ideas and needs and we produce a plan AND get straight into action on the day. By the end of our time together you might have a new garden layout sketch with a list of plants to buy. We may even have been to buy some and put them in. You might have had a session that teaches you how to create simple flower bouquets along with a plan for your cut flower patch. You may have had a session where I teach you how to make wedding favours – like hand-made chocolates to give to your guests. (You can flavour the chocolate with flowers from your garden – how special is that)? Or we might have designed an edible flower garden for you to include beautiful floral menus for your special occasion. I love getting creative with the things we grow in our gardens and my VIP days combine your love of crafts, cooking and gardening to create really special events (and gardens). If this is something that appeals to you – please book a consultation to have a chat. The people who seek my help are often people who fit the following descriptions. If you recognise yourself in any of these then there’s a very good chance that you would benefit hugely from my help. If you’re in any doubt just get in touch to have a chat. The Garden Whisper is designed for people who love their garden and their plants but don’t know much about gardening or their plants. It’s a table of all the plants in your garden with instructions on what to do now to keep them looking good and staying healthy. It also gives information on what to expect from your plants each month – for example, whether they will be in flower, going over or just sending up shoots. Plus, it also gives more general advice like when to feed, mulch, the best way to deal with unwanted weeds etc. It’s​ sent to you via email each month for a whole year. This helps to avoid overwhelm and means you’re more likely to use it (rather than put it to one side and forget about it). If you have any particular things you want to know, you can tell me and I’ll include them. 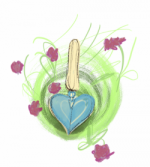 I created The Garden Whisper because so many people tell me that the two things they wish they knew are what plants they have in their garden and how they should look after them. So, if you find yourself wondering (even worrying) about when to cut back, prune, deadhead, divide, mulch etc, etc and you don’t have the time to trawl through books and internet articles, or do a course on gardening, then the ‘Garden Whisper’ might be just the thing you need. 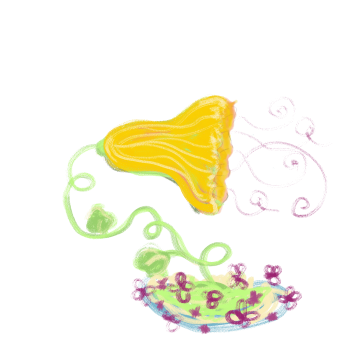 ​The Garden Whisper gives you information in bite sized chunks. 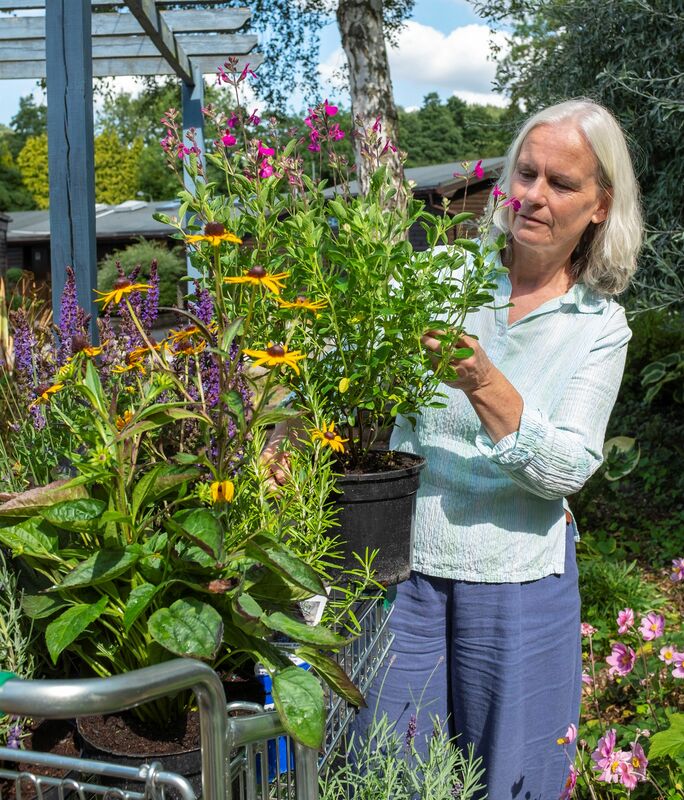 It’s a bespoke maintenance plan, a gentle whisper each month that tells you what to do to keep your garden looking great and your plants healthy. You can also buy the Garden Whisper as a stand alone product. It would make a great gift for someone new to gardening or with a new garden with unfamiliar plants. If you’d like to work with me to transform your life through your garden all you need do is click HERE to book your FREE 30 minute consultation. I’ll listen to your story and offer you three tips that you can do now to start your project and we can decide together the best way that I can help you. If you’re still not sure, you can either click HERE to book a chat for further information or you can simply email or telephone to find out more. Let’s chat about how I can help you create a garden you love.